At 62 years old, John has transformed a 200 square-foot community garden at Imagine Art into a lush, 2,000 square-foot oasis that boasts over 120 species of fruits and vegetables which supplement over 400 meals each month for those in need. Many times the efforts of volunteers are hard to quantify, but the fruits of John Macpherson’s labors are literally tasted by dozens of local artists with disabilities each week. At 62 years old, John has transformed the 200 square-foot community garden at Imagine Art into a lush, 2,000 square-foot oasis that not only provides a peaceful setting for the artists served, but also boasts over 120 species of vegetables and fruits which supplement over 400 meals each month for those in need. Overcoming his own disability on his way to becoming an incredibly talented artist, John has been involved with Imagine Art for over 15 years. He’s shared his talent with organizations like Art From the Streets as a featured artist, taught local students and his fellow artists with disabilities as a teacher, used his unique perspective to advocate for underprivileged artists with many organizations in Austin, and was even honored as the Volunteer of the Year by then-governor Ann Richards as a result of his work as Freeze Shelter Coordinator with the Austin Resource Center for the Homeless (ARCH). 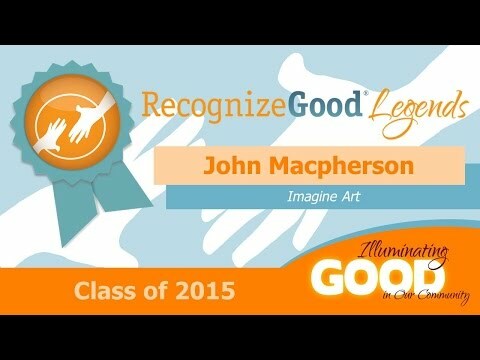 John has accomplished many things and created many works of art, but perhaps his greatest “canvas” has been the Imagine Art community garden which feeds those primarily limited to disability income and food stamps. Occasionally leading groups of volunteers in the garden, its transformation is largely a result of John’s own sweat equity as he worked tirelessly – often upwards of 50 hours per week – without pay to break calcium deposits, mulch pathways, and nurture plants with his own hand tools until they eventually bore the okra, squash, lettuces, kale, onions, beets and other produce that now feed his hungry neighbors in need.